State and federal officials have implemented an aggressive eradication effort following a new Oriental fruit fly discovery in Miami-Dade County. The insect is capable of attacking 400 different fruits and vegetables. Announced by Florida Agriculture Commissioner Adam Putnam on June 5, the work is being conducted within a 1.5-square-mile area around the sites where three flies were detected. Staff members of the Florida Department of Agriculture and Consumer Services and the U.S. Department of Agriculture are involved in the eradication program. Three years ago, the agencies successfully eliminated the pest after another introduction – one of several since the 1960s. The flies can potentially cripple much of Florida agriculture and its annual value of $127 billion, inflicting major damage to the general economy. Florida Farm Bureau President John Hoblick expressed his appreciation for the prompt agency response to the emergency. “I want to thank our state and federal personnel for their good work in identifying these flies and mobilizing for a comprehensive eradication program,” Hoblick said. 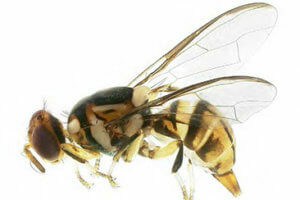 For more information about the discovery of the flies and the eradication effort, click here.